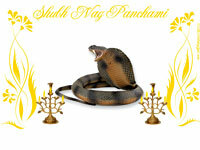 The month of Shravana brings with it the occassion of Nag Panchami. A festival dedicated in honour of serpents, Nag Panchami witnesses religious celebrations by millions of pious Hindus in India. Make your Nag Panchami celebrations more grand with our beautiful wallpapers themed to Nag Panchami. Set these onto your your desktop screen and pay a tribute to the snake-deities you adore so much. In case you want to send any of these cool NAG PANCHAMI WALLPAPERS to your friends and loved ones, we have also provided you with that option underneath each wallpaper thumbnail. If you like to share the entire collection of Nag Panchami wallpapers with your pals, just click here and refer this page to them. 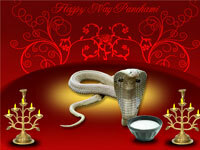 Wish you a Happy Nag Panchami! Tip: Take a look at these attractive Nag Panchami wallpapers. Just click on any of the links alongside any of the wallpaper images given below to get it in the size you want for your desktop. The image will open in a new window and after it loads fully, right click on the image and choose "Set as Desktop Background". 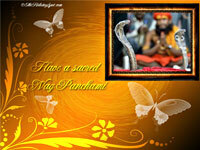 So set one of these Nag Panchami wallpapers on your PC screen now, and give a virtual tribute to the serpent-gods.